We are proud to announce that we are now offering Healthy Paws Pet Insurance at Geldin Insurance. Here at Geldin, we believe our pets are part of our family and we want to protect them as well. Healthy Paws offers one pet insurance plan covering everything that matters including injuries, illnesses, genetic conditions, and emergency care. If your pet needs treatment for an accident or illness, and it’s not a pre-existing condition, you’re covered. It’s that simple! 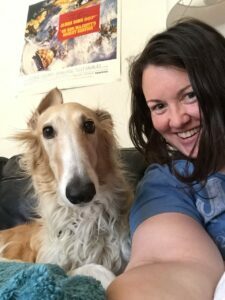 Our seven-year-old Borzoi Xana needed urgent, extensive care to treat a lung lobe torsion (more simply put, a twisted lung). Healthy Paws reimbursed over $17,000 for all of her treatment which included multiple surgeries. Without this coverage, we would not have been able to afford to treat her — I don’t even want to think about that. Thank you, Healthy Paws!